WE MANUFACTURE PRESSURE VESSELS AND TANKS FOR E.G. Supply security and sticking to the schedule are a question of honour for us. Long-term customer relationships are a sign of customer satisfaction. Our versatile machinery, modern production facilities, and professional employees have won us a certificate for internal quality controls. Our employees are professionals in the field. Our trained and experienced welders guarantee high quality. Read more and join us! We offer demanding solutions for demanding circumstances, with guaranteed supply security. Jarte Steel Oy has more than 30 years of experience in the manufacturing of stainless and acid-proof aluminium tanks. Our tanks are made for the demanding needs of the food, pharmaceutical, chemical, and wood processing industries. Each tank is custom made for the specific needs of the customer, taking into account the use circumstances, and always according to highest quality standards. Best quality, supply security, and competitive prices are a question of honour for Jarte Steel. Our customers are happy to recommend our products and excellent services. 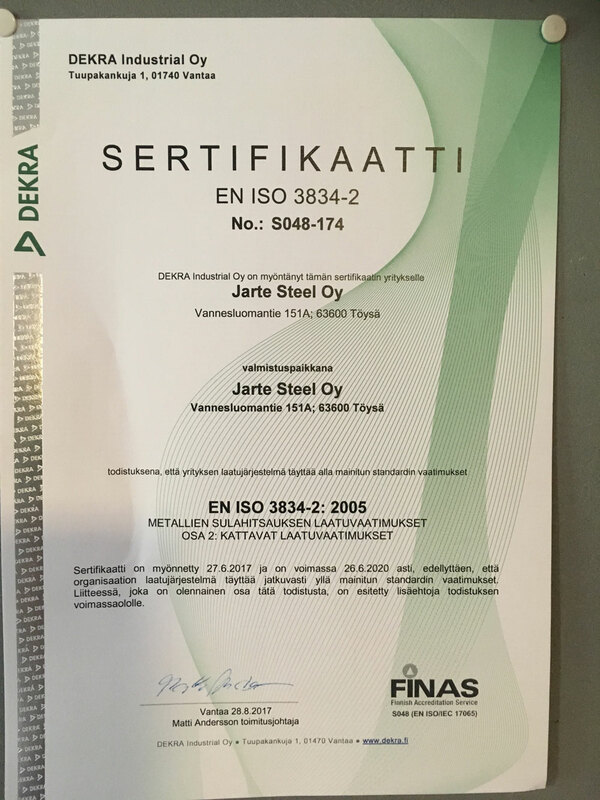 Our diverse machinery, modern production facilities, and professional employees have won us certificate for internal quality controls, where the independent inspector DEKRA Industrial Oy has inspected, tested, and evaluated the welded structural steel assemblies and product systems made by Jarte Steel and certified that they meet the requirements of standard EN 1090-3:2009+A1:2011. 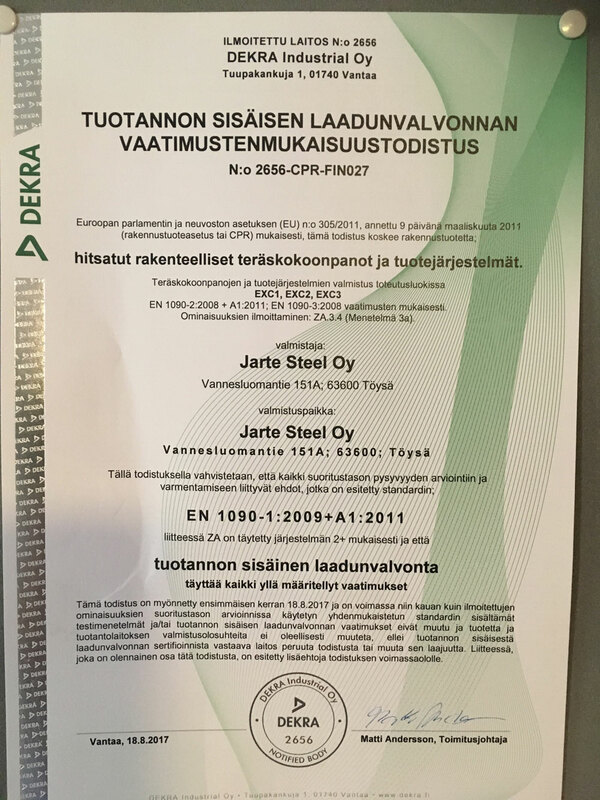 Marko Mäkinen has enjoyed working for Jarte Steel for almost 20 years. Trained as a plater-welder, Marko enjoys carrying out diverse work tasks where the results of his expertise are immediately visible. Antti Loukasmäki is currently in his tenth year with Jarte Steel. He is trained as a carpenter, but during the years he has also acquired metalworking competence and completed welding class certifications according to changing work tasks. Antti thinks that different work sites create their own variety and challenges on the job, and that the team spirit and flexible working culture at Jarte Steel raise occupational satisfaction into a league of its own. Jarte Steel employs 11 people, and all of their welders have passed class welding certifications. The staff are very happy to work here, as is indicated by the high retention rate and morale. We work through even the busiest of times as a team, and make sure that the customer gets their order in time, and always with best quality. TOP PROFESSIONALS ENSURE A HIGH QUALITY LEVEL. ARE YOU ONE OF US?